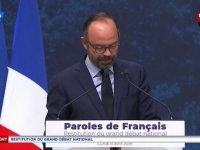 USPA NEWS - The French, PM Edouard Philippe unveiled today, at the Grand Palais, the first conclusions from the Great National Debate, (« Grand Debat ») before the arbitration that will be carried out by the President of the Republic in April, 2019. The decline in taxation among others, the track to lower VAT to support the purchasing power, or the audio-visual axis or inheritance rights. The Prime Minister. The so-called « Grand Débat », or Great National Debate is a nationwide public consultation launched by President Emmanuel Macron in January in response to the Yellow Vest protest movement. “We have reached a point where hesitating would be worse than a mistake, it would be a failing,” the Prime minister told a crowd in Paris today. “The need for change is so radical that any conservatism, any cold feet, would be in my eyes unforgiveable,” he said before sketching out four requirements to emerge from the debate: cutting taxes, addressing the sentiment of neglect in some territories, building tools for a “more deliberative democracy” and better responding to climate concerns.